Chinese authorities have arrested a monk and his nephew for inciting self-immolation protests in Sichuan province, state media says. Xinhua reported that the monk confessed to encouraging and publicising the protests, under orders from exiled spiritual leader the Dalai Lama. Exiled Tibetans said the confession was forced and denied any involvement. A recent legal ruling stipulated anyone aiding immolations would be charged with murder. Dozens of Tibetans have set fire to themselves in protest against the Communist Party's rule since 2009. Many have died. The authorities have periodically launched crackdowns, rounded up suspects, locked down monasteries and subjected monks to political re-education. 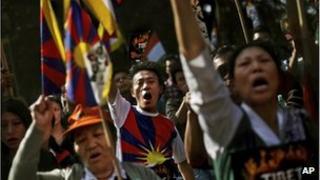 But protests have continued in Tibetan communities in Sichuan, Tibet, Gansu and Qinghai. Most recently, activists reported two separate immolations on Saturday in Tibet, with one monk dying of his injuries. On Sunday, Xinhua quoted a police statement saying 40-year-old monk Lorang Konchok had encouraged eight people to set themselves on fire since 2009. The report says he and his nephew recorded details of the protesters, gathered photographs, and passed them on to exiled groups in India. Loran Konchok was based at the Kirti monastery in Aba prefecture, which has been a focal point for self-immolations. The Tibetan government-in-exile, based in the Indian town of Dharmsala, denied accusations of involvement by its representatives or the Dalai Lama. "We believe [the suspects] have been forced to make these confessions," spokesman Lobsang Choedak said. "We would welcome the Chinese government investigating whether we are instigating these immolations." The arrests follow a ruling by China's top courts, reported in a commentary in the party's Gannan Daily newspaper, that increased punishments for anyone suspected of encouraging the protests. "The opinion makes clear that those criminals who act as principal culprits behind the scenes to organise, direct, and plot as well as those who actively participate in inciting, coercing, enticing, abetting, or assisting others to carry out self-immolations, will be held criminally liable for intentional homicide," the paper said, according to a translation on the Dui Hua website.